Bon soir. I am Charlotte's grandfather, Etienne--or as Charlotte calls me, Pépère. Charlotte's father, my son, died tragically when Charlotte was three, so my wife Bernadette and I raised Charlotte. Bernadette and I came to America after the war. Ah, Bernadette, the love of my life. Such a lovely bride. She takes my breath away. She was a dancer, you know? A ballerina. But the arts were not appreciated in worn-torn France, and we wanted a simpler life. When we arrived in Providence, we knew we were home. And we quickly realized that locals and tourists were clamoring for delicious flavors, so we decided to create a cheese shop. We opened Fromagerie Bessette, or as the people in town often call it--The Cheese Shop. I ran it while Bernadette--who never fails to amaze me with her energy--quickly became involved in the town's politics. She is mayor now, for a third or fourth term--I cannot remember. And she runs the local theater, Providence Playhouse. Such productions she and her theater people put on! The theater has earned rave reviews. I could not be prouder. Today, I am working in the shop and singing, "I'm in the mood for love" to pass the time...oh, pardon. Charlotte needs my assistance. "I am here, chérie." I am doing inventory in the kitchen. And singing, but I do not tell her that. She will tease me. "Pépère, quick, we need to take five pounds of Smoked Gouda to Bella Ristorante." It is the four-star restaurant in town. Luigi Bozzuto is always dishing up something elegant. "What does he plan to make today?" I ask. "A twist on the pub's five cheese and macaroni dish." "Aha, poaching." Timothy O'Shea's Irish Pub is well-known for its appetizers. I shook a finger. "If we are not careful, we might have a chef war." Charlotte laughs. "I don't think Tim will mind." She looks over her shoulder. "By the way, did you hear about Meredith's plans to turn the old abandoned winery into a college? Meredith wants to have a fund-raiser. We're going to provide the food and wine. and fondue! Where's Matthew?" Charlotte and her cousin (my grandson) Matthew took the reins of Fromagerie Bessette a short while ago. I am getting on in years and the two of them felt the shop should grow. At first I fought their ideas, but their enthusiasm...it was infectious. "He is visiting the local wineries." I elbow her. "By the way, you have your own visitor, sitting in the garden out back." The town of Providence created a co-op garden with a hothouse in the alley behind the stores on Hope Street. All year round, we grow tomatoes and herbs. "He has a picnic." Charlotte's cheeks flush a luscious pink. This man makes her glow; he makes her light-hearted. I love to see her like this. She suffered as a child; she was so serious. And then that fiancee of hers left town. Bah! I could have wrung his...well, it is not right for me to say what I could have done to him. Mark my words, if he ever shows up in Providence again, he will have me to answer to. "Can you watch the cheese counter?" Charlotte fusses with the hair around her neck and dabs her mouth with lipstick. "Mais oui, cherie. And I will make sure Luigi gets his Smoked Gouda." "No tasting," she says. "You know what Grandmère said about sticking to your diet." I point to my chest and put on an innocent face, but my sweet granddaughter is wise to me. She raises an eyebrow. "If you do taste, and I know you will, be discreet. No telltale crumbs. And see if you can get the recipe out of Tim, okay?" She kisses both my cheeks and dashes to the door at the rear of the shop. As Charlotte leaves, I cannot help but worry about what she said earlier. The Ziegler Winery has a bad history. Bernadette will not be happy with the plan. "Trouble will follow," she will say, and I fear she will be right. In the meantime, I go to the restaurant, and I cajole Luigi into giving me the recipe for the mac 'n cheese. If you would like a copy, click this RECIPE LINK. It will make a nice Valentine's meal, no? For the love of your life. And if you have a moment, share with me. What is your favorite cheese? Have you ever eaten a cheese in Europe? Be sure to catch Avery Aames at her website, on her other blog Mystery Lovers Kitchen, on Facebook, and on Twitter: @AveryAames. BTW, Avery shares RECIPES on Thursdays on MLK. All Cheese Shop Mysteries may be ordered from B&N, Amazon, etc., and Independent bookstores. A SNEAK PREVIEW and BOOK TRAILER of LOST AND FONDUE is now up on the website. Click here. 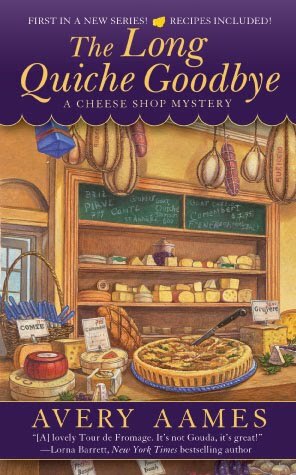 If you'd like to know more about A Cheese Shop Mystery series and want to download a few other recipes from me (on recipe cards), click on this link to my website: Avery Aames. I've posted recipes in the "morsels" section. There's lots of other fun stuff, as well. And sign up for the mailing list to get in on the next contest...coming every two weeks as we approach the launch of L&F in May. I can't decide which is my favorite cheese. I'll have to move into Fromagerie Bessette and sample them until I figure it out. Which will be never . . . I've never eaten cheese in Europe (or done anything in Europe, for that matter), but I sure do love cheese! Oh Pepere (I apologize if I address you too familiarly, but I feel as though I know you well). You are one of my favorite characters and I'm so happy to see you here today. Gouda is my current favorite cheese, and I have been fortunate to enjoy cheese in Europe - for the first time this past fall. The most memorable was in Montmartre... I can't wait to go back! I just discovered goat gouda! It comes in a huge wheel with the most gorgeous Delft pattern on it. Delicious! Well, well, bon soir, ladies. So nice to see you all posting a comment to me. I blush. Krista, the goat gouda is delicious. Tart yet creamy. Julie ~ you might always address me informally. I am an informal man. Ahhh, Montmoatre. Janet - we will welcome you with open arms. Providence is a bit cool this time of year, but a visit in the spring, around April or May, is delightful. We will look for your smiling face. Wendy - cherie, cheddar is one of my favorites as well. It is always one of the favorites of my author, Avery, and today she is sharing a Valentine's Day platter of cheddar and chocolate on Mystery Lovers Kitchen that you might enjoy! Do not miss it. Ah, fromage et amour... quelle bonheur! And now that I have massacred the French language... this story sounds like a lot of fun. I can't remember the cheese that I had while in France but it was good. Cheddar is one of my favorites. Well, Pépère, my favorite cheese is whichever one I am eating at the time. I've never met a cheese I didn't like. But, if pressed, I'd have to choose Purple Haze from Cypress Grove - a lovely goat cheese with lavender and fennel pollen. Unfortunately, I've never eaten cheese in Europe. Dru - I must admit that I, too, love Cheddar. I recently ate a Cheshire cheese that is one of the earliest recipes known for Cheddar. From the 12th century, though the cheese is made in recent times. Harbingerdc - I adore Purple Haze. You have captured the finishing tastes perfectly. It is lovely with roasted mushrooms. And to all, a trip to a cheese shop will probably make you feel like you are in Europe, so do not despair. ~Good eating to all. Say cheese. I'm traveling to France in Aug. & will delight in their cheeses, I'm sure. You have some wonderful suggestions here & in the first book. I'm looking forward, too, to reading the next one. I am glad you are there to support your beloved, Charlotte. And as for cheese, it's a toss-up between very old cheddar (and we do a good job of that in Canada) and lovely creamy Brie. Off to have a snack. Erika and Mary Jane - how lovely to meet you both. May you enjoy your travels and your tasting experiences. I do adore a creamy Brie, left at room temperature for an hour or so, and it is absolutely luscious.